A lot of Russian ammunition sports a steel casing, and this is for a couple of reasons. First, it’s simply less expensive to produce than brass. 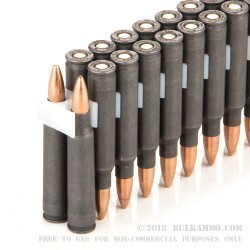 Second, their government prefers keeping track of their civilian population’s ammunition supply, which puts handloading rather out of the question. 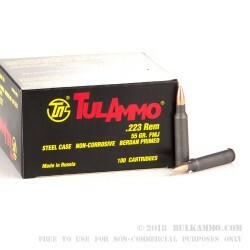 That’s the great trade-off you have to consider when buying steel cased ammo: less expensive, but fire it only once. 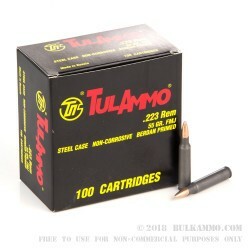 If you have no intention of handloading in the first place, however, then this affordable 223 Rem cartridge by Tula ought to present an attractive opportunity. This round’s 55 grain bullet sports a full metal jacket, so it’s optimal for extended visits to the range where you’d rather not clean your bore quite so often. 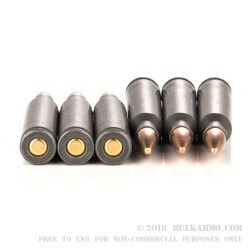 It is fitted with a non-corrosive Berdan primer, which even further reduces its fitness for reloading. Its steel casing does sport a nice polymer coating, so it will feed and eject more reliably than steel alone would permit. It did what I wanted it to do. A: Hello Joseph, This ammunition is manufactured in Tula's Russian based ammunition manufacturing plant.